To be so strong that nothing can disturb your peace of mind. To talk health, happiness and prosperity to every person you meet. To make all your friends feel that there is something in them. To look at the sunny side of everything and make your optimism come true. To think only of the best, to work only for the best, and to expect only the best. To be just as enthusiastic about the success of others as you are about your own. To forget the mistakes of the past and press on to the greater achievements of the future. To wear a cheerful countenance at all times and give every living creature you meet a smile. To give so much time to the improvement of yourself that you have no time to criticize others. To be too large for worry, too noble for anger, too strong for fear; and too happy to permit the presence of trouble. all the best wishes life can brings... God bless everyone!!! *eat healthier and smaller portions less frequently - ha ha! Coz, God Gift us a “BRAND NEW YEAR 2011”. Have a promising and fulfilling in new year 2011. Throughout the Coming Year may your life be filled with little celebration of Happiness...Wishes you a Bright, Happy and Prosperous New Year 2011 with God Bless. A Joyful Spirit, A Healthy Body & Heart full of Love. All these are my Prayers for You. Wish a Happy New Year 2011. Thank you I wish you a wonderful 2010 as well. Wish the biggest slice of happiness and good luck this New Year! Wish a New Year filled with peace, prosperity and happiness. NEW YEAR - That brings something new in life. A resolution to bring hopes and a spirit to overcome all the darkness of past year. A determination to start all things with a new beginning which we failed to complete in the past year, some new promises to make life more beautiful, peaceful and meaningful and of completion of all desires that are deserve to be, to get ultimate pleasure. Have a lucky and wonderful 2011. Think of joy, forget the fear. Be joyous, Coz its new year! Is Saal ka Sare Sapne poore ho Aapke. God bless you through out the NEW YEAR 2011. 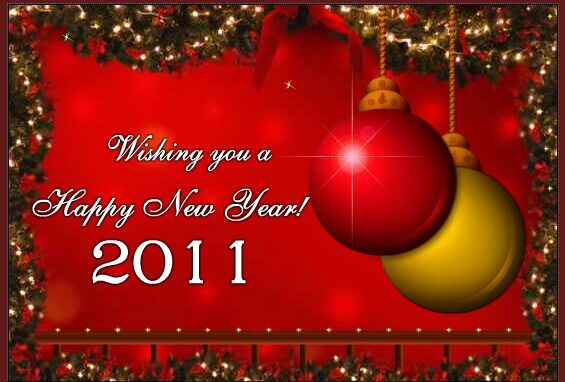 Wish u all a very very successful year 2011. may all your dreams come true. Wishing u a very 'HAPPY NEW YEAR'! everywhere they will follow you. I wish your present and future always shine. and New bringing along many reasons for celebrations. write down what you are doing on a daily basis. Then fill in and or scratch off activities in areas that you would like to improve in. Then follow your list and hope for the best.